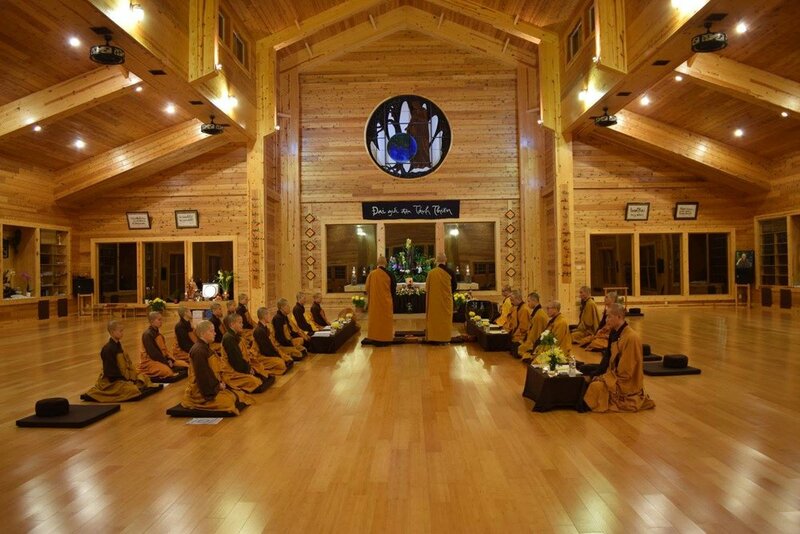 Magnolia Grove Monastery is a residential monastery and mindfulness practice center in the tradition of Plum Village, founded by Zen Master Thich Nhat Hanh in 2005 in Batesville, Mississippi. Today, more than thirty monastic disciples of Thich Nhat Hanh are in residence. Ten years ago, Magnolia Grove was little more than 120 acres purchased by a group of committed individuals and families. With hard work, dedication, and coordinated effort, our community created a large meditation hall with an adjoining commercial kitchen to feed participants, and built by hand a guesthouse to host 120 laypeople. Magnolia Grove Monastery is a place to practice meditation and mindfulness. It is where every breath we take reminds us of the wonders of life. A place to sit and relax. A place to walk and kiss the earth beneath our feet. It is a place to rest under a willow tree on an island in a lotus pond. A place to eat together and savor every bite. A place to listen deeply to the sounds of life and the sound of our hearts. A place to work together to build a community of love and understanding. Magnolia Grove is a place where we can stop running and discover peace with every step we take. A place to remind each one of us that the present moment is a wonderful moment. Visit Magnolia Grove to register for retreats and learn more about the monastery. As with any facility, the buildings at Magnolia Grove Monastery require general maintenance and repairs. To support the upkeep of the facilities at Magnolia Grove, please consider making a sustaining monthly gift of any amount that is comfortable for you.